Sir, I apologize for the radio silence as of late. We have been hard at work training with METF (Mongolians) and Gurkhas. Things have definitely been "boring," more so than usual. The fighting season is close to an end, but not quite, so we're still expectant of something more happening before winter rolls around. You'll notice our task org is small. 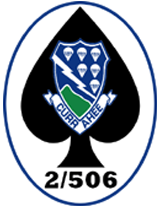 When we deployed we were told our mission set would require fewer PAX, so in addition to 6 PAX I lost to injury/legal issues, I lost another 5 PAX now serving in 1st and 2nd PLT. However, we fought to keep our best; while we lost one we really wanted to keep, the people represented in the picture earned their place there. A morning run to the "Top of Currahee Mountain" brings it all home. 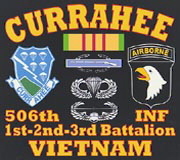 _Three generations of currahee veterans have now shown the world that the motto "Once a Currahee, Always a Currahee" is alive and well. _In each of the future reunions this core group will grow and grow. I believe that the "Torch has been Passed" and that time will reveal the true hearts of these young Vets. They have come together for the support and benefit of all. 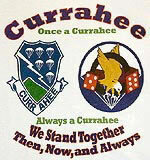 Come what may, "Currahees - Then, Now, & Always!" Gary's Gilliam Report. 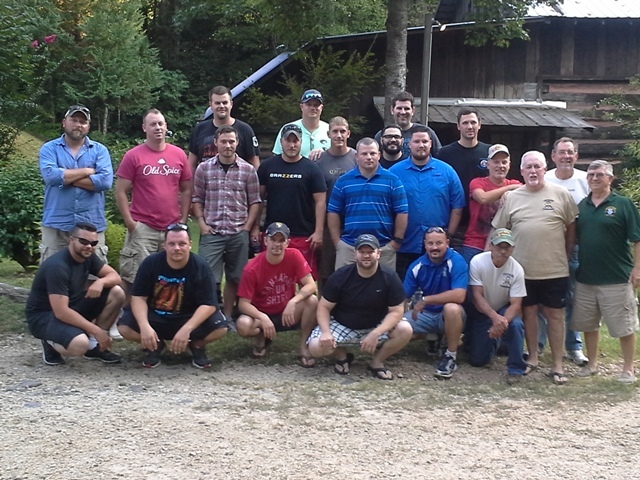 . .
Over Labor Day weekend Charlie Company 2/506 2004-2009 had their first reunion attended by Kerry Bassett, Tony Garcia, Josh Williamson, Nick Fout, Chase Hamley, Josh Kemp, Chris Gildner, Josh Swink, Seth Vance, Chad Sears, Mike Hall, Charles Peifer, Tommy Vanier, Eric How, Dustin Simmons, Ezekiel Rivera, Nate Weiss, along with some of their significant others. Dave Simonds, Frank Matsko, Glenn Shuman, Bob Lister and I attended their first reunion and it was amazing. They had 17 attend and 5 old Currahees crashed their party. We were treated so amazing but we went with a mission to encourage them to join with us as we go to Ft Campbell next year as Charlie Company. They ran up Currahee Mountain while we followed in the 4 wheel drive Yukon. It was a hard run for them but we did shut off the AC so we could experience the hard climb to the top. 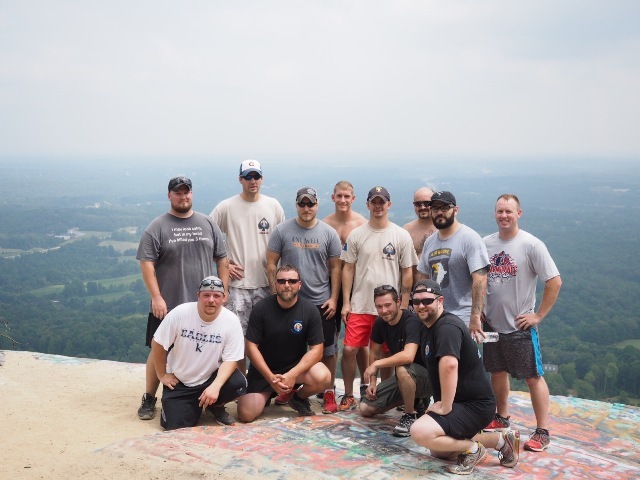 Currahee mountain is 3 miles up and 3 miles down I have to say we old Currahees hardly broke a sweat. Job Well Done & Welcome Home!! . . . . We will see you in March!! 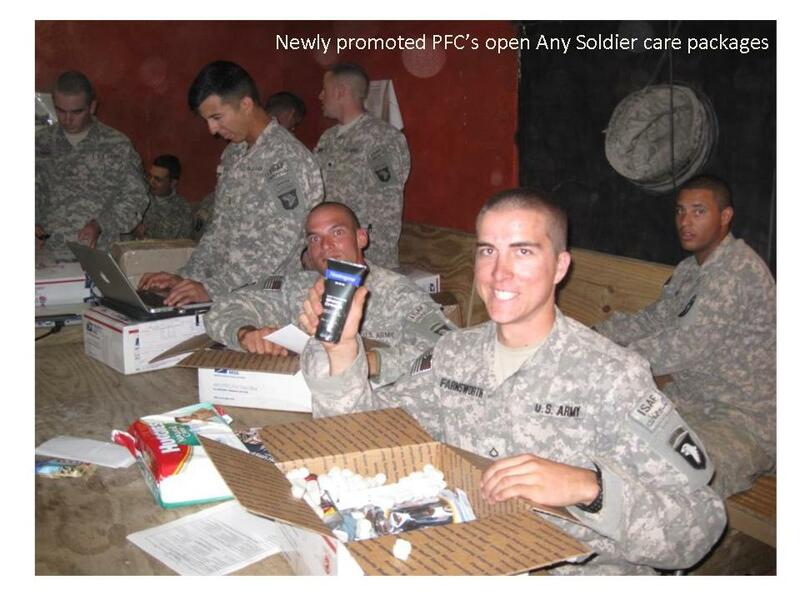 Straight from Fort Campbell KY....The latest news and happenings right from the CO's Office. 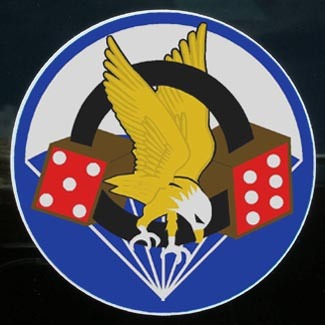 The Company Commander desires to work closely with us Vietnam Veterans, and keep us informed on the most recent developments. 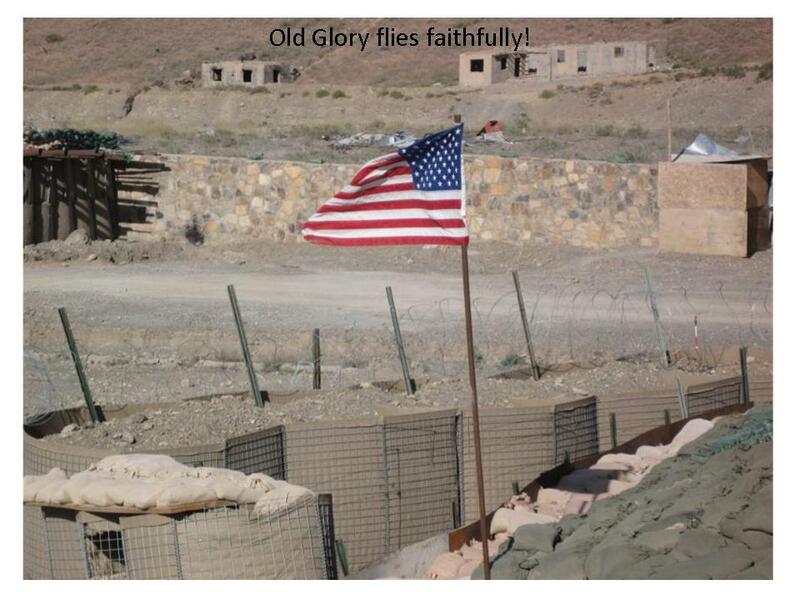 It is of great importance to all of the 2/506th members, past and present, that the Currahee Tradition of the older veterans supporting the active soldiers of today continues to stay strong. Once a Currahee, Always a Currahee! To that end, our website will begin to work closer and harder to keep you up to date. 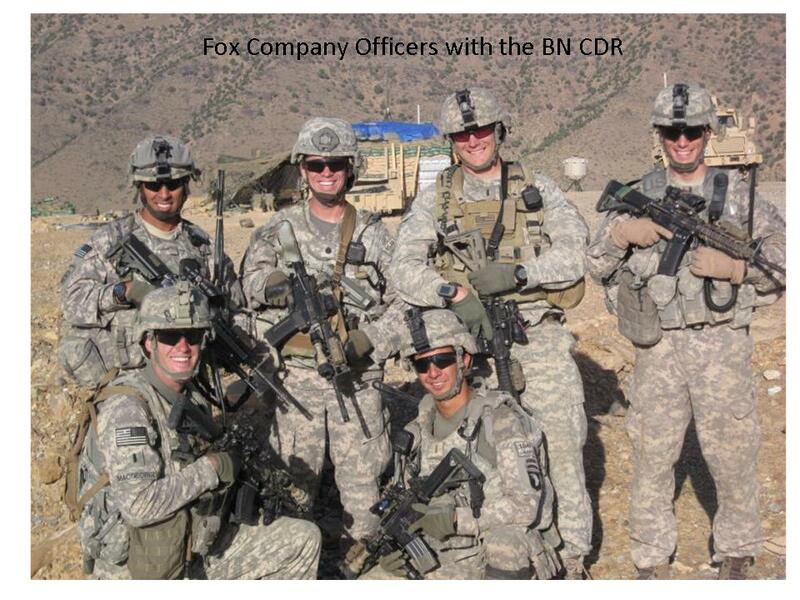 Watch "C 506th" in action during this deployment (AKA Fox Co.) . . .
______I trust this note finds you enjoying a wonderful Christmas and looking forward to a spectacular New Year! 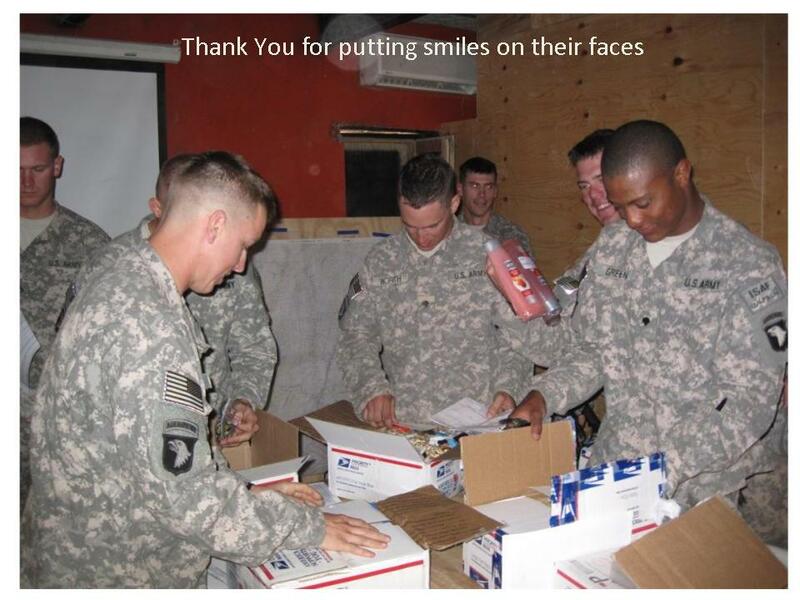 I want to apologize for taking so long in tendering my thanks on behalf of the entire 1st Platoon for the wonderful goodies you have collected and sent to us. We have enjoyed them immensely!! Just to give you an update on the guys, 1st Platoon is finally 100% deployed in theatre. 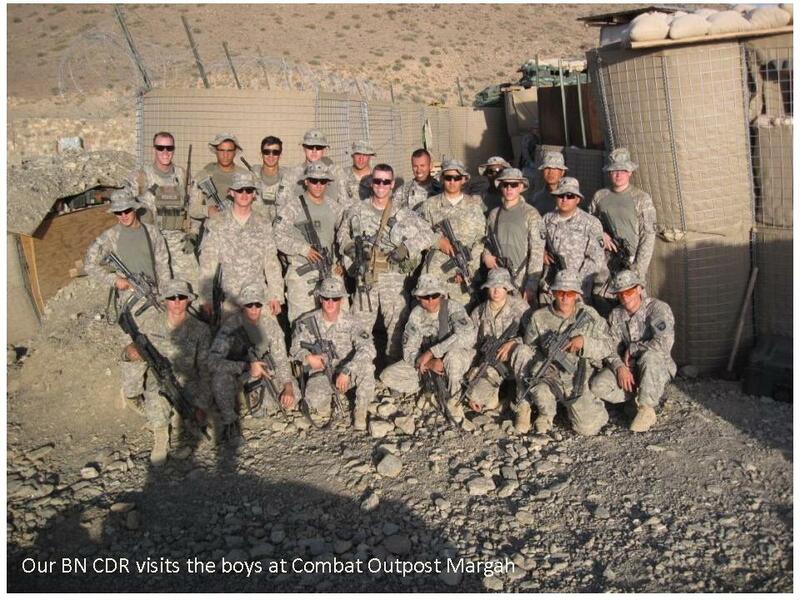 Several guys, including myself, were late deployer’s due to schools (Ranger School in my case) or dwell time. We were the force protection platoon for a couple months but have finally begun running our own missions. Despite being on force pro for the first part of the deployment, many members of the platoon have already distinguished themselves. 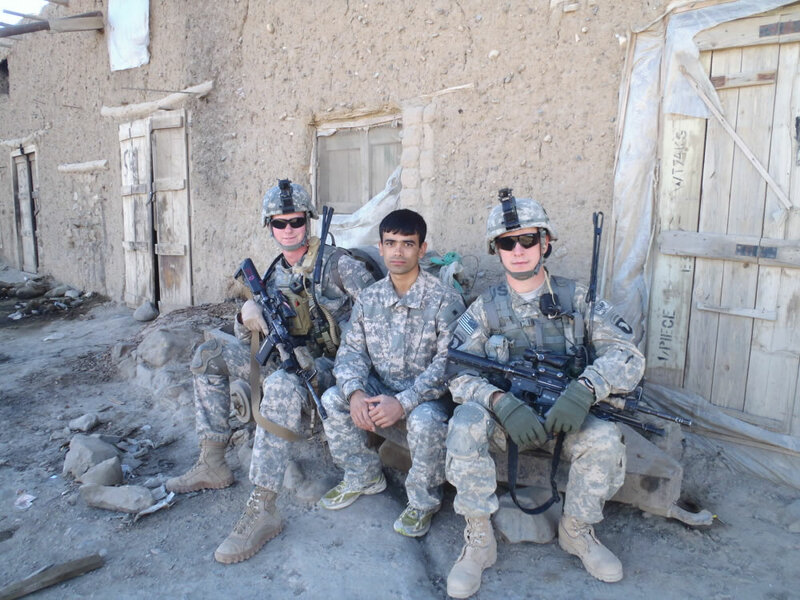 A detachment from 1st was involved in the 30 October battle at COP Margah in which 50 or so Americans killed around 120 insurgents who attacked the COP. Our Weapons Squad Leader distinguished himself in the battle and was awarded the “Silver Star” by Gen. Petreaus. Several other members of the platoon received valor awards. Our platoon also has the highest number of Purple Hearts in the Company, although, thankfully, they are all for relatively minor injuries. I continually remind the platoon that this is not a record we prefer to hold. However, it does demonstrate the unflinching bravery of the men of 1st Platoon who will risk their safety to close with and engage the enemy. Next month, the platoon will be running missions out of COP Margah, in the northern part of our Company’s battle-space. Mail is sporadic out there but I do have a few requests to pass on from the boys should you send another package during the winter. The guys love catching up on the latest news, sports statistics, and pop culture via magazines. They are also partial to items such as gum, M&Ms, and any other snacks portable enough to take on mission. Some of the guys have become almost addicted to the little instant coffee packets as well because they can carry it with them on a multi-day patrol. With the cold winter setting in, hand and toe warmers are also a God-send. They guys use them not only to keep their extremities warm, but to ensure the doc’s medical supplies don’t freeze during the night. I will send some photos of the platoon as soon as I can get them off my camera and you are welcome to share them with friends and fellow Currahees. 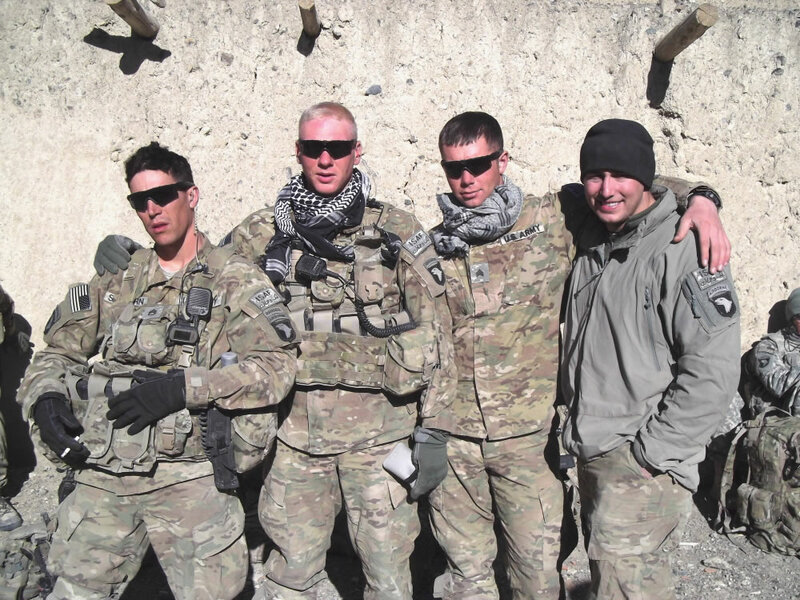 We have a great group of men, tough in a fight, brutally honest with each other, willing to sacrifice everything for a brother in arms, and always ready with a smile or joke to ease the aches of a long patrol. No matter what annoyances or admin problems I deal with during deployment, I count it the greatest honor and privilege to be able to lead and fight with these men. Thank you so much for your faithful support and care for the men of 1st Platoon. 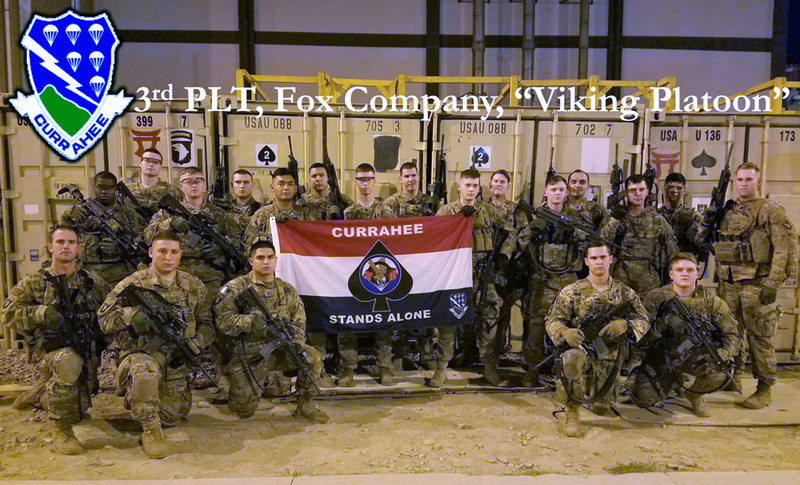 The battle cry of the regiment is “Currahee!” – “Stands Alone!” However, with the support of faithful our friends back home, we know that we are never truly alone. 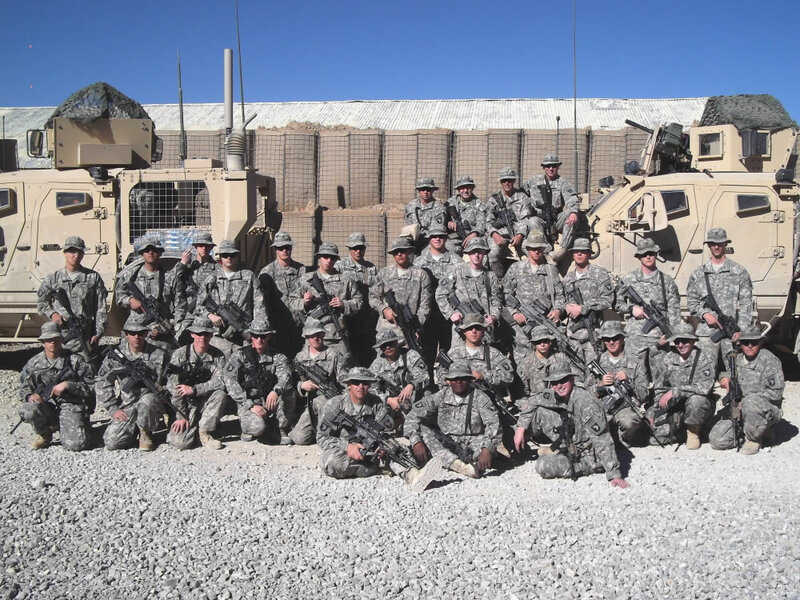 From the boys of 1st Platoon – Thank you all very much and have a Merry Christmas and Great New Years!!! Dec 2010 . . . .Here are some recent pictures of 1st PLT. Please feel free to pass these along to the rest of our friends and supporters back home. Thanks. 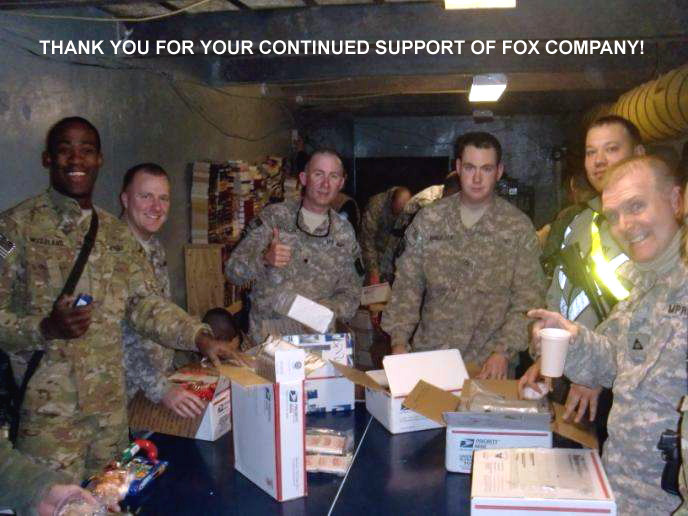 19 Dec 2010 . . . . Fox Company wishes everyone a very Happy Thanksgiving and a very Merry Christmas!!! We have been extremely busy fighting off the bad guys and building our lil Combat Outpost. We are very thankful for having your support. The boys had a blast celebrating with our extended families in combat. Nov 16 2010 . . . .Thanks so much for your support! We have been very busy and it's starting to get cold here. 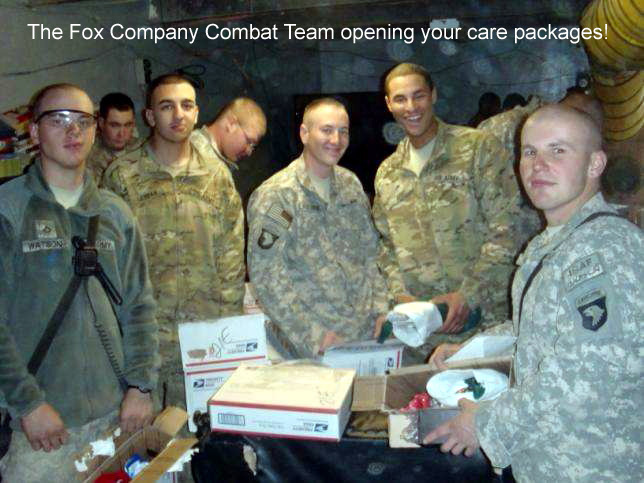 We really appreciate all the goodies and snacks and personal hygiene stuff you send us. Please keep sending us microwavable foods, Cup-O-Noodle soups, Tuna-in-a-Box, Ritz Crackers, Gummy Bears, Sour Patch Kids, Coffee (we looove our coffee), Creamer, Sugar, Splenda, Honey Buns, Gum, Music CDs, DVDs, Nuts, Crackers, Laundry Detergent, Baby-Wipes and hygiene items! Oh and since our living and cooking is very rudimentary, please send us some spices, marinades, and hand mirrors so that we can shave! 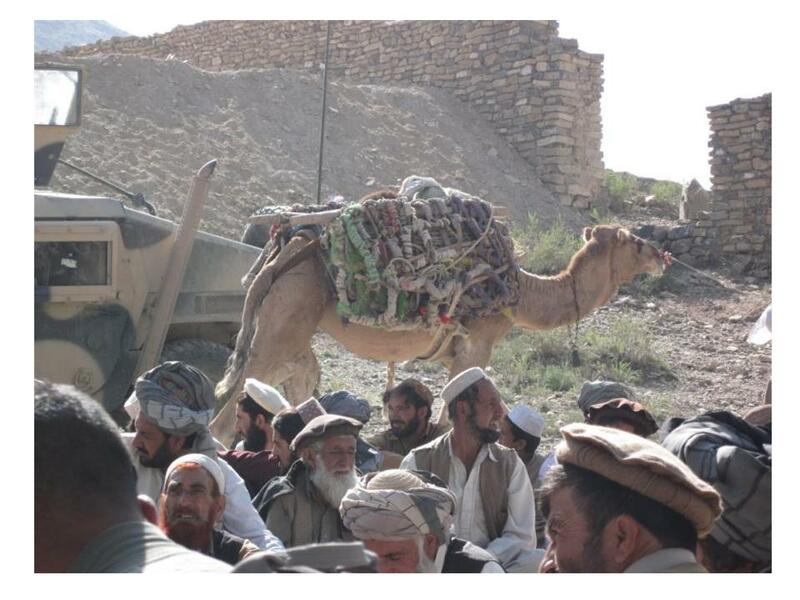 WASHINGTON, DC, September 2, 2010 - Coalition forces repelled an insurgent attack in the Bermel District of Paktika Province after a failed attack on Combat Outpost Margah. 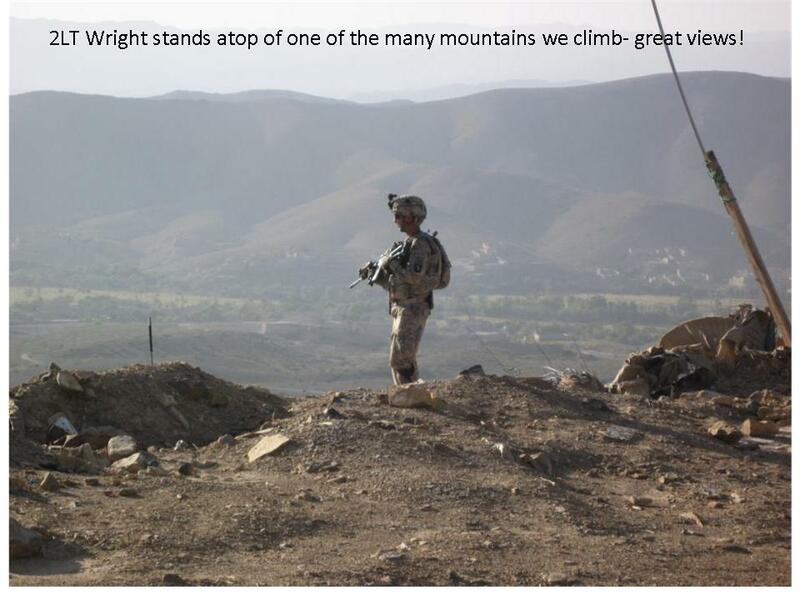 The attack began in the early morning with insurgent small arms and indirect fire against the outpost. 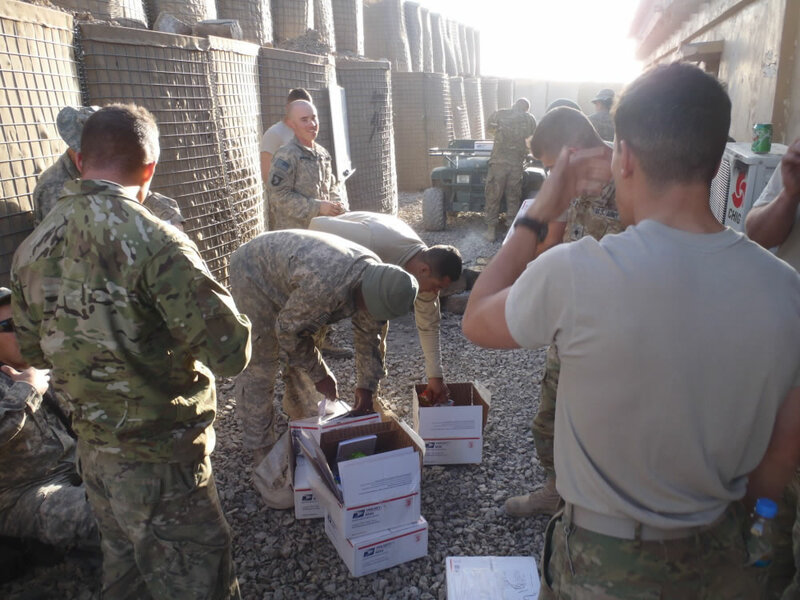 Soldiers from the 1st Battalion, 187th Infantry Regiment and 2nd Battalion, 506th Infantry Regiment responded to the attack with mortars and small-arms fire before calling for support from Task Force Viper, 1st Battalion, 3rd Aviation Regiment. 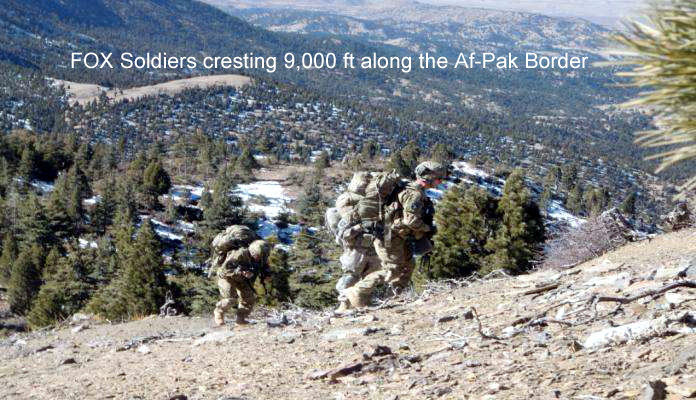 Aircraft conducted two passes over the area, killing at least 20 insurgents in two separate engagements. 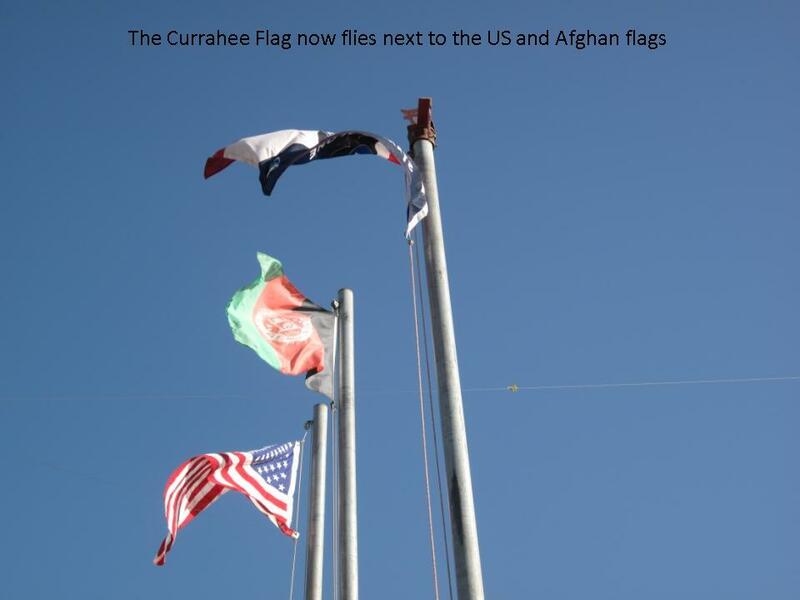 No coalition or Afghan forces were injured in the attack. SEP 2010 . . . . . 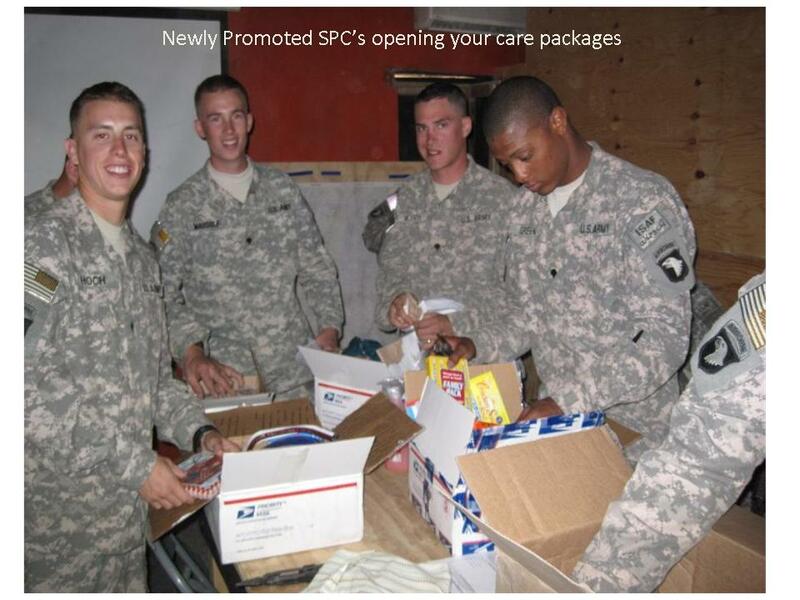 Your "packages from home" mean a great deal in the life of a soldier on the front lines.